Solving tons of problems will not help you! Solve problems with necessary variability and complexity to enhance your understading and problems solving skills. 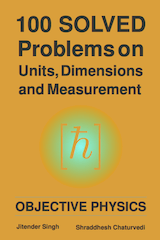 We selected 100 such problems on units, dimensions and measurement for you! Give brief overview of key concepts. Cover all types of problems. Dimensional analysis, significant figures, least count of measuring instruments, vernier calipers, screw gauge, searle method, measurement error and error analysis. Problems arranged in ascending order of complexity. Problems are in objective type format. Solutions are detailed and easy to understand. All critical points are emphasised. The selection of 100 problems is really good. Problems are arranged in increasing order of difficulty and solutions gives detailed explanation. I Liked these problems! Excellent book! Good attempt to incorporate almost all types of problems. More than enough for the students doing preparation at any level. The book is published by PsiPhiETC . Its average rating on Amazon is 5 out of 5 (from 2 reviews as on 27 January 2019). This book is available in Kindle eBook as well as Paperback (Print on Demand from Pothi.com) formats.